On the scenic shores of Grand Lake — just an angler’s cast from historic Pensacola Dam — sits a building, devoted to greater ecosystems management and education in the Northeast Oklahoma lake region. 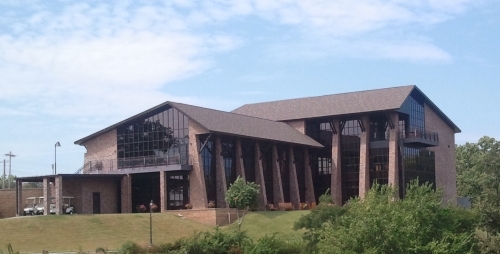 It is fitting that the 16,000 square foot Grand River Dam Authority Ecosystems & Education Center sits on a rock bluff in Mayes County, overlooking south Grand Lake; after all, the building needs to be on a solid foundation to successfully support all the potential it holds. 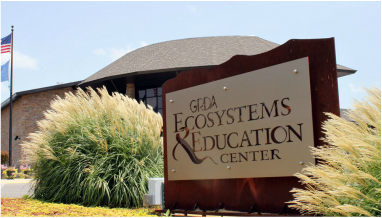 The Ecosystems & Education Center is the latest tool for Grand River Dam Authority (GRDA) to use in bringing a greater focus to lake management issues. With nearly 70,000 surface acres of water under its control along the Grand River, GRDA has a responsibility to be a good steward of natural resources. In spring 2004, the agency committed itself to making resource management a top priority. Soon after, the GRDA Office of Ecosystems Management was established. Fisheries development, habitat enhancement, shoreline clean up, water quality monitoring and compliance are some of the areas under the GRDA Ecosystems Management umbrella. The Center includes a state-of-the-art water quality laboratory that is the home of that umbrella. As the next door neighbor to historic Pensacola Dam, the GRDA Ecosystems & Education Center has become the origination point for the popular free tours of the dam, offered by GRDA during the summer months. Each year during those tours, thousands of visitors get an up-close and personal look at Oklahoma’s first hydroelectric facility and member of the National Register of Historic Places. Built by Great Depression-era labor in the late 1930s, the dam has been producing renewable, hydroelectric power since 1940. Exhibit space, devoted to telling the story of GRDA’s history and the construction of Pensacola Dam, is included in the facility.